"Some of the most famous highway ghost stories stem from fatal accidents on the road. " The Sunshine Skyway Bridge that crosses the Tampa Bay region is considered to be haunted by ghost investigators, locals, and travelers alike. 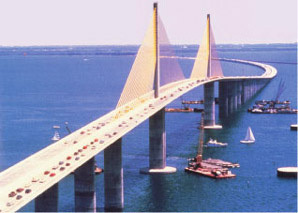 The official name for this immense structure is the “Bob Graham Sunshine Skyway Bridge”. The length of the bride covers an amazing five point five miles, or twenty nine thousand forty feet. While the waters that the bridge passes over are considered to be part of Hillsborough County, the bridge actually connects St. Petersburg, which is located in Pinellas County and a city that is part of Manatee County called Terra Ceia. The bridge that currently stands was officially dedicated on the 7th day of February in the year of 1987. In this article on haunted routes, you will learn many interesting facts pertaining to this haunted bridge. The bridge that currently stands today is completely different from the first bridge that stood which was identified by the same name as the current one. The first mode of transportation prior to the construction of the original bridge was a ferry. This water vessel maneuvered individuals from the location of Point Pinellas to the area known as Piney Point. Individuals in the area saw the need for a more efficient means of transportation, and by the year of 1954 they got it. This was when the original Sunshine Skyway Bridge’s construction was completed. By the late 1960s, the interstate standards changed substantially and the need for another bridge developed. In 1969, a second bridge was constructed that ran parallel to the first so that the lane count was four. Many believe that the first bridge was cursed as it experienced many tragedies. When it comes to haunted routes, haunted bridges almost always carry some sort of story associated with an accident that occurred in the water directly under or near the bridge. The same holds true for the haunted Sunshine Skyway Bridge over Tampa Bay. The first tragedy associated with this bridge occurred on the 28th day of January in the year of 1980. The USCGC Blackthorn was setting out from the Tampa Bay region. At the same time, there was a water vessel typically identified as a “tanker” that was approaching Tampa Bay. This water vessel was named “Capricorn”. As the Blackthorn approached the bridge, it came in contact with a cruise ship that was considered to be very brightly lit. In an effort to avoid the cruiser to protect the passengers onboard, the Blackthorn moved to the center of the region so that it could pass. Unfortunately, it was unable to properly identify the Capricorn that was approaching due to the blinding lights and the fact that it was still dark outside. As a result, the ships collided. The ships did not stop at the bridge, the wreckage continued nearly one mile out from the bridge. This tragedy resulted in the deaths of an estimated twenty three crew members between both water vessels. While the fact that this tragedy does seem to have had an impact on the community and the bridge itself, there have been no particular stories pertaining to hauntings that could be the souls of those involved, but if you are riding along the haunted route at night, you may catch a glimpse of the residual remnants of the tragic boating incidence or one of the crew members looking for land…. The most devastating disaster that occurred with the Sunshine Skyway Bridge in Florida occurred on the 9th day of May in the year of 1980. There was a freighter named the “MV Summit Venture” that collided into a special support column pier during the time of a torrential storm to the area. As a result of this collision, an amazing twelve hundred feet of the bridge crashed down into the waters of Tampa Bay. When this happened, a total of six vehicles fell one hundred fifty feet down directly into the Bay. In addition to this, a Greyhound bus also plummeted into the rough waters. Only one man, who would carry the burden the rest of his life, survived the fall. His name was Wesley MacIntire. Today, the remaining spans of the original bridge serve as the “Skyway Fishing Pier Park”. A new bridge, which still stands today, was constructed for motorists interested in traveling over Tampa Bay. In addition to the accidents that have occurred on the Sunshine Skyway Bridge , several individuals have committed suicide by jumping from the highest span of the bridge. Since the year that the new bridge opened, well over one hundred people have killed themselves at this location. In addition to this, many other people have attempted suicide at this location but have either been injured instead, stopped from doing it, or simply changed their minds. The amount of individuals that have either tried suicide, been suspected of committing suicide due to never being found, or have successfully killed themselves has resulted in numerous “Crisis” telephones being placed along the structure. As a result of the accidents and the suicides that have occurred at the Bob Graham Sunshine Skyway Bridge, there seem to be a large number of ghosts that still have a connection to the roadway that crosses Tampa Bay. One of the most popular stories involves a young woman who was often seen at the top of the bridge, displaying all the characteristics associated with a suicide jumper. Several people have reported this female to authorities and local law enforcement agencies have reported this continuously throughout the years. Despite numerous witness accounts, no female was ever found. This story eventually became known as the story of a female that did, in fact, jump off the bridge. As time progressed, toll booth workers and motorists would see this lady hitchhiking. Many motorists picked her up and expressed the fact that she become extremely nervous in the car, wanting to get to the other side. Eventually, the female would simply vanish from the vehicle she was in. The next haunted tale involves what is believed to be the Greyhound Bus that crashed into Tampa Bay in the year of 1980. Today, it is referred to as the “Ghost Bus”. It has been said that twenty two people died on the bus the day that the bridge collapsed into the water as a result of the freighter wreck. Many witnesses claim that while visiting the fishing pier – which was the original bridge – that they see a ghostly image of the bus traveling near them. Many claim feeling an actual breeze and even catching a whiff of the gasoline that is often near a moving Greyhound. Is the Skyway Sunshine Bridge in Florida haunted? According to the locals, it is one of the most haunted bridges in the Sunshine State. For us, this remains to be one of the greatest unsolved mysteries of the popular peninsula.